Lewis Hamilton has taken pole position for the 2015 Italian Grand Prix at the Autodromo Nazionale di Monza. The British driver took yet another pole, his 7th in succession, ahead of the two home heroes Kimi Raikkonen and Sebastian Vettel in the Ferrari’s. Nico Rosberg was a disappointing 4th after his team had to change his new-spec engine to the one he used at Spa. The drama of qualifying had begun before the session even got under-way. Mercedes announced before the session that that Nico Rosberg would be reverting to a previously used engine instead of the new specification engine that was introduced to both him and team-mate Lewis Hamilton for this weekend. This, thankfully for Nico, would not warrant a grid penalty as he wasn’t having a brand new engine fitted. Work continued in the Mercedes garage for the opening minutes of the first session, with Toro Rosso mechanics also working on Max Verstappen’s engine and Daniel Ricciardo confined to the Red Bull garage for most of the session. The Manor cars were the first to set a time before being beaten by the Force India of Nico Huilkenberg and then Sergio Perez. Lewis Hamilton was out fairly early along with the two Ferrari’s, with Hamilton making his way to the top with a reasonable 1’24.649. Bottas, Vettel and Raikkonen would soon make up the places directly behind him, with Rosberg’s first effort with his replacement engine only yielding 6th. He would then jump up to 2nd but he was still half a second down on Hamilton. With just over 2 minutes to go, Red Bull managed to get Daniel Ricciardo out on track, with the Australian previously looking unlikely to set a lap in qualifying. His one and only lap was enough to put him 14th. A great effort by Red Bull to get him through to Q2. 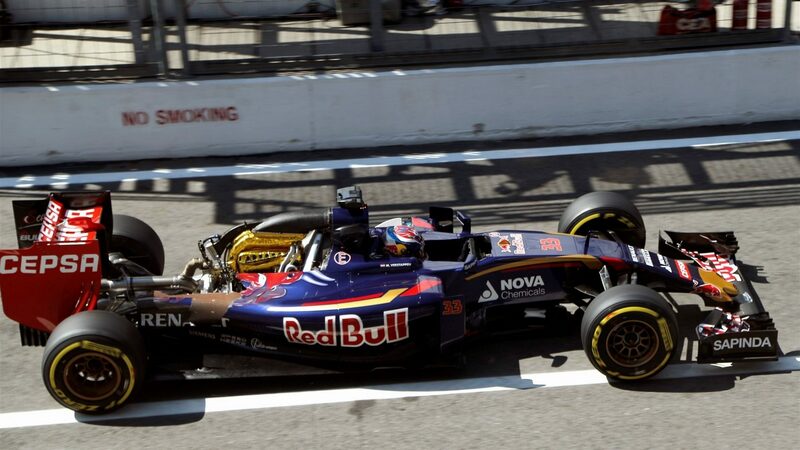 Max Verstappen would sadly not be able to follow his lead in the Toro Rosso. The Dutchman did get out onto the track but not with enough time to get round the track to start a lap. In their hurry to get him out on track, it appeared as if the mechanics hadn’t properly fitted the engine cover on the Toro Rosso as it exploded at the Curva Grande at the end of the session. He would be eliminated from qualifying along with Fernando Alonso, Jenson Button, Will Stevens and Roberto Merhi ahead of him. Hamilton was quick to make his way back to the top spot once again as he put in a 1’23.383. He had led every single session at Monza so far and was hoping to do so again in Q2 and in the final session of Q3 later on. Nico Rosberg had been in 2nd place but was once again 7 tenths down. This opened the door for the two Ferrari’s to split the Silver Arrows, with Raikkonen moving to 2nd ahead of Vettel in 3rd. 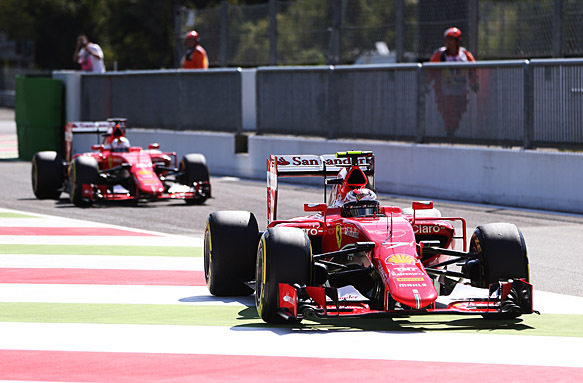 This provided the fanatic Ferrari supporters, the Tifosi, with some much needed euphoria. Hamilton and Raikkonen elected not to make a 2nd run in the closing stages of the session, with all the other drivers who had set a time taking to the track once again. Felipe Nasr and Romain Grosjean were in the drop zone as the checkered flag came out. They were joined by a few drivers who had yet to run. Grosjean was able to vault his way up to 7th as he departed the drop-zone. This put Maldonado down into elimination along with Nasr, Sainz, Kvyat and Ricciardo; with Daniel not turning a wheel in Q2. Lewis Hamilton looked to have the advantage over his team-mate Nico Rosberg as the final session of qualifying dawned. Rosberg was the first Mercedes to set a time, but Lewis would soon come through to set a 1’23.397 to take provisional pole position. Nico Rosberg’s new engine really didn’t look to be up to scratch, as once again he was separated from his team-mate by the two Ferrari’s and even the Williams of Felipe Massa. The final run of the session saw Raikkonen manage to vault ahead of his team-mate Vettel to move into P2, but neither of them could bridge the small gap to usurp Hamilton. Nico Rosberg managed to put in a last lap that would move ahead of Massa but still behind the Ferrari’s. He would start in a disappointing P4, with the two Ferrari’s set to challenge pole-sitter Lewis Hamilton on the run down to the infamous turn 1 chicane. Lewis has now taken his 7th consecutive pole position, one shy of Ayrton Senna’s record of 8 consecutive poles. It has been a recurring theme in the last few races for the Mercedes drivers not to have very good starts, so we could very well see the Tifosi go wild if the Ferrari duo can take the lead on lap 1. *A number of drivers have received grid penalties for engine changes. The actual starting order will be included in the race results in my report tomorrow.